Knowing what you put into your mouth is something a lot of people are interested in, especially if you are a vegan, have a food allergy, avoid some ingredients for religious reasons, or if you are just a bit picky. However, when traveling, it is often tricky to know what you are ordering. At Wikimedia Sverige (Sweden), we like food, traveling, and most certainly open data, so we started contemplating what we could do to make life a bit easier for the frequent flyer. What we ended up with was "Restaurants and Wikidata 2015," where we hoped to show what open data can bring to all kinds of different sectors. We were able to make it all happen thanks to Vinnova's investment in the Nordic Open Data Week. Our awesome marquee at Smaka på Stockholm. Photo by Jan Ainali. CC BY-SA 4.0. A couple of months ago we initiated a cooperation with the food fair Smaka på Stockholm ("Taste of Stockholm"). They sent us 30 menus from participating restaurants in advance. From these menus, we identified roughly 300 different food-related terms and during three weeks in May we hosted the Wikidata Menu Challenge, where volunteers from all over the world were invited to translate ingredients, cooking methods, and dishes and pair them with appropriate images and sound recordings of native speakers pronouncing the words. All this was done in the open and was accessible from the start through Wikidata.org. Wikidata is a collection of structured data that can be edited by computers and people alike. The knowledge base is easy for computers to understand and therefore the information can easily be included in various products. A main focus is of course Wikipedia, but the possibilities are unlimited, which was what we wanted to show with this project. All these translations and all the media were then automatically pulled from Wikidata and repackaged into nice multilingual menus. Overall 183 people edited the 300 items on Wikidata and added a whooping 4,700 translations! Plus, 102 images and 1,140 recordings of pronunciations. In total there were 9,057 edits made, which can be compared with 493 edits the month before. A full 1,832,120 bytes were added during the challenge. Since the items had also been worked on prior to the challenge, a total of 19,274 translations in 349 languages existed by the time we started showing the menus at the food fair. Additionally, 284 of the 300 items had images and almost all had audio recordings in at least one language. In parallel with the challenge we also worked on developing the design of the menus, based on the initial design by User:Denny, and make it possible to display both images and sound on them. Thanks to great volunteer support, we could work on the layout and customize the menus. Thursday, June 4, we opened up our tent at Smaka på Stockholm. We would stand there for four days and had loaded up with lots of brochures, posters, pens, stickers, and more. 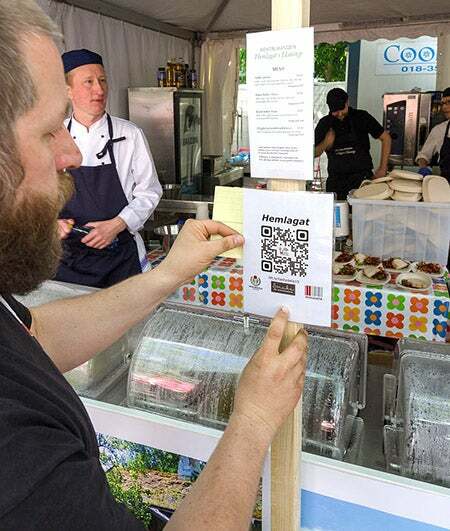 On the tents of participating restaurants we had set up QR codes that linked to their translated menus. A QR code being placed. Photo by Arild Vågen. CC BY-SA 4.0. Samsung was kind enough to lend us a bunch of Tab 4 tablets on which we could demonstrate the menus to visitors and allow them to try them out for themselves. During the four days, thousands of people passed by our tent. 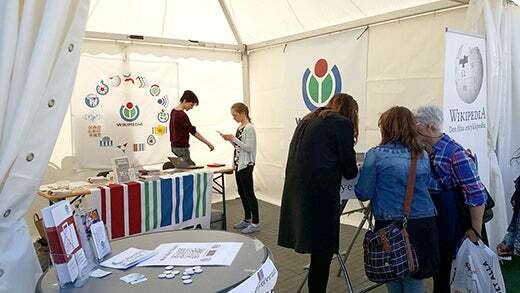 That someone would stand at the food fair and talk about Wikipedia and Wikidata was not what the visitors expected, and their surprise made a lot of people stop and ask us what was going on and what we were doing there. The fact that we were not expected was in itself an ice breaker. Because of this, we could reach groups that we usually don't. Overall we had more than 220 conversations about open data and the Wikimedia projects, and how to contribute to them. It's a result we are very pleased with! People were impressed with the menus and there were a few that knew restaurant owners that they thought would love to implement this. Others noticed that some words were not translated in their language and wondered how they could help to complete them. Some people stopped and talked with us for close to half an hour. The chapter got a handful of new members, and we even had a couple of developers who came past and wanted to start volunteering on similar projects. As all the material is open data, free content, or free software, the menus can now be used by any restaurant owners who want to make their menus more easily understandable to tourists and others. Take a look and see if they would be a good addition to your business! With the help of open data we can make traveling even more easy and enjoyable. John Andersson - I am a free knowledge enthusiast that nowadays has the great pleasure of working as a Project Manager and with fundraising at Wikimedia Sverige, the Swedish branch of the international WIkimedia movement. For years I have been an active contributor to Wikimedia's projects, to OpenStreetMap (especially Humanitarian OpenStreetMap Team (HOT)) and a number of other cool initiatives - and I am planing to be involved in one capacity or another for years to come. Great article. I shared it with many friends.